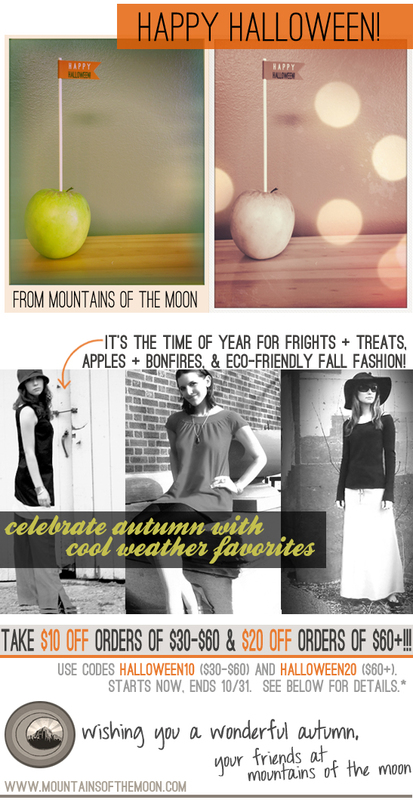 Bubby and Bean ::: Living Creatively: Eco-Fashion + Halloween Coupon Goodness! Eco-Fashion + Halloween Coupon Goodness! This morning, we sent out the October Newsletter for my eco-friendly clothing line, Mountains of the Moon, and I wanted to share the goodness with all of you as well! Today through Halloween, we're offering two awesome coupon codes to use in our shop >> HALLOWEEN10 will get you $10 off any order of $30-$60, and HALLOWEEN20 will get you $20 off any order of $60+! These coupons can be used on anything (except gift certificates) - including sale items - so it's quite the discount. :) If you like vintage-inspired clothing made from all eco-friendly fabrics, just click on the image above to check out all of our fall styles. Enjoy! Also - be sure to check back tomorrow to see who won the October group Giveaway! If you are thinking about a Holiday Sponsorship here at Bubby and Bean, make sure to book your spot ASAP. This is the most quickly ad spots have ever sold, and there are only a couple left for November. Click here for more info!